Can’t get enough of hunting and fishing? We’ve discovered some of the best outdoor oases that cater to avid outdoorsmen and offer the best of both worlds. Love both hunting and fishing? Here is a region-by-region look at the best places to enjoy both. “Cast and blast,” you say? In Iowa, that might be October walleyes at first light, before climbing into a treestand in the afternoon ...or if Ohio in April is more your speed, a gobbler off the roost followed by some post-lunch crappie fishing. Partial to the Black Hills? If so, there are plenty of possibilities that should have you hankering for either trout or turkeys, or both. Multiple species, all out of one basecamp. That’s the dream. And these are the destinations. Folks spending time in southern Iowa have their own version of the newspaperman’s Three W’s. In print, the words, or questions, asked by the journalist to his or her interviewee are “who,” followed by “what,” and concluded with “where.” For travelers looking to relax and enjoy some of the finest hospitality the Midwest has to offer, however, those words have much more enjoyable connotations — “walleyes, whitetails and wild turkeys.” And few places are better to set down roots and enjoy Mother Nature’s bounty than at Honey Creek Resort on beautiful Lake Rathbun. Located just north of Centerville, Iowa, Honey Creek Resort, as well as the original 850-acre Honey Creek State Park, is managed by the Iowa Department of Natural Resources (IDNR). Those searching for an outdoor basecamp have plenty of options at Honey Creek, ranging from the property’s 105-room lodge to more rustic one-, two- and four-bedroom cottages — 28 in all to choose from. An indoor water park, championship 18-hole golf course, and fine dining, courtesy of the Lakeshore Grill, are certain to keep all members of the family happy and entertained. For anglers, Lake Rathbun needs little introduction. A tremendous year-round trophy walleye fishery (a 12-pound, 12-ounce fish was netted by the IDNR in April 2018) attracts much of the angling attention; however, the lake also holds excellent numbers of crappies, channel cats, flatheads, largemouths and white bass. In the spring, boaters concentrate on Rathbun’s many small bays as they vie for their 25-fish limit of fine-eating crappies... that is when they’ve not traded the rods for shotguns and head-to-toe camouflage as they try to fool a gobbler on Rathbun’s thousands of public hunting acres. Come fall, the boats move out onto the shallow rocky flats in search of walleyes, while archers take to the trees waiting out that buck of a lifetime. All told, almost 16,000 acres make up the game-rich wildlife management area, with hunting opportunities not only for deer and turkeys, but pheasants, bobwhite quail, cottontails, fox squirrels and waterfowl. For more info: honeycreekresort.com; (866) 797-5308; Centerville Chamber of Commerce; centervilleia.com; (641) 437-4102. South Dakota’s Black Hills are undeniably beautiful; the area around the town of Deadwood is even more so. And for the hunting and fishing enthusiast, it’s difficult, some might say impossible, to find a place on the planet with more in the way of outdoor opportunity. Combine this with incredible lodging, and you have what many consider the ultimate basecamp. Located a short three miles southeast of Deadwood, the Lucky Chip is a six-bedroom, 3 1/2-bath custom log home on Strawberry Hill Lane that features beautiful views, multiple fireplaces, a regulation pool table, and, for that after-hunt relaxation, a jetted hot tub. Fully furnished, the Lucky Chip comes complete with satellite/big screen TV, Wi-Fi, air-conditioning and a washer/dryer — everything you’ll need for those in-home days, of which there will be few. Why? Too much to do outside. For the turkey hunter, your hunt begins literally as you step out the door of the Lucky Chip. The Black Hills National Forest covers some 1.25 million acres in both South Dakota and neighboring Wyoming and is home to an excellent population of Merriams longbeards. This is demanding terrain, with the day’s hunt taking you through major elevation changes and into country that can only be described as rugged. But gobblers aren’t the only game in town. Whitetails abound throughout the Hills, as does small game like cottontails, jackrabbits and squirrels. Predator hunters will find more than their fair share of coyotes throughout the Hills. The national forest is also home to mountain lions, so best keep on your toes and your head on a swivel should you decide to do some calling. The hunter can become the hunted in a heartbeat. And anglers, you’re not forgotten. To the south of the lodge, Deerfield and Pactola lakes offer fishing for a variety of species, including huge brown trout, splake (brook/lake trout hybrid), rainbows, bass and some dandy yellow perch. Throughout the Hills, countless cold-water streams provide the perfect backdrop for fly-fishers to recreate their own version of “A River Runs Through It.” A wealth of information about fishing the Hills can be found at flyfish.sd.com. Contacts: Executive Lodging, executive-lodging.com; (605) 578-3555; Deadwood Chamber of Commerce; deadwood.com. Few things are more relaxing than a quiet morning on the water. What is it about a sunrise in the deer woods? When it’s just you and your fly rod, you and your bird dog, you and your son in a duck blind … There’s literally an ocean, lake, river, forest or desert where your next outing flushes away your cares and reignites the passion you have carried for the outdoors all your life. Perhaps you’ve just discovered the outdoors and your passion is but yet a small flame. Either way, what if you’ve planned your fishing or hunting around a luxurious respite? Oh, the possibilities! Antelope Creek Lodge, located about 20 miles northeast from 14,000-foot-high Mount Shasta in Northern California, is a diamond in the rough that is surrounded by more than 65,000 acres of national forest. Antelope Creek Lodge caters to a maximum of eight guests who enjoy wonderful accommodations, great food and absolutely terrific trout fishing that begins right at the doorstep. The lodge is within a stone’s throw of the serpentine, 2-mile-long fish-filled Antelope Creek and within walking distance of the ranch’s two trophy-trout lakes. Each year several guests post pictures of themselves holding a 30-plus-inch trout. The two-story Antelope Creek ranch house features four spacious bedrooms with private baths and phenomenal views. The massive stone fireplace, a sunken bar and wrap-around decks set the mood. Enjoy the hot tub on the back deck. Delicious meals are included in the package and served around the fishing schedule. Fine complimentary wines are served with the evening meals. The daily rate for this getaway is $325 per person based on double occupancy, $425 for singles, and a two-night minimum stay is required.Antelope Creek Lodge is booked exclusively through The Fly Shop — theflyshop.com, 800-669-3474 — in Redding. For a family that’s looking for adventure in the great outdoors, along with amazing activities, this is the place! Situated on 3,000 acres high above the old Western-theme town of Winthrop in north-central Washington, Sun Mountain Lodge features a broad range of both summer and winter activities for you, your spouse and even the youngest adventurists in your family. Winthrop is a center for outdoor recreation — mountain biking, ballooning, golf, skiing, snowmobiling and more — but it’s the fly-fishing guides of North Cascades Fly Fishing, based at Sun Mountain Lodge, that the anglers in the family will want to meet. Book the team for a float trip on the Methow River, where catch-and-release fishing for rainbow and cutthroat trout takes place in 14-foot inflatable, self-bailing rafts with a top-of-the-line fishing frame for floating. If you’re looking for a place to learn about fly-fishing, the lodge offers fly-casting classes from May to mid-October. Guided fly-fishing trips leave the guesswork up to the experts on the Methow River and Moccasin Lake, located just minutes from Sun Mountain Lodge. Only six rods are allowed on the 30-acre private lake — a very private and pristine retreat — surrounded by rangeland and mountains.The average trout runs more than 3 pounds, and some catches have weighed more than 10 pounds. Sun Mountain Lodge provides luxurious guest rooms, a full-service spa, a 5,000-bottle wine collection with private wine cellar, and a triple-A-rated four-diamond gourmet restaurant. Rates start at $265 per couple per night midweek. Booking and activity information is found on the lodge website at sunmountainlodge.com or call the lodge office at (800) 572-0493. Many believe Colorado offers the country’s best big-game hunting opportunities, and Bear Paw Lodge, 20 miles east of Durango, can place you in the middle of some of the state’s best hunting zones for mule deer and elk. Affordable lodging at Bear Paw Lodge consists of comfortable cabins and vacation home rentals that are available May through October, offering great accommodations for early season deer and elk hunters. The lodge is located in game management units 75/751, a region known to produce record-book bucks and fine elk. We’re talking muleys with antlers 30 inches wide! Hunting guides and pack services are available and are priced at the request of the customer. Mule deer tags for these hunting zones are available only through drawing (applications due by early April). Elk tags for the muzzleloader season (early to mid-September) and the first (mid-October) rifle season are also awarded through a draw system. But elk tags are available over the counter for archery hunting (late August through mid-September), as well as the second (mid-October) rifle season. Bear Paw Lodge suggests its guests book their hunts with outfitter Preston Goetzke at Bugle ’Em Up Outfitting Company in Bayfield — online at bugleemupoutfitters.com or by calling (970) 903-5129. Goetzke’s team offers both guided hunts and drop camps for trophy elk and mule deer. Call for pricing. Bear Paw Lodge cabins and vacation homes are fully furnished with everything for relaxing after your hunts. Rentals start as low as $110 per night and are fully equipped with barbeque grills, fireplaces, TV/VCRs and more. Most have a private outdoor picnic table, too. Plan your stay at Bear Paw Lodge online at bearpawlodge.com or call (970) 884-2508. It’s well-known that the coastal region is a great place to combine a hunting and fishing trip to make a cast-and-blast adventure at a variety of local lodges. $ LILY POND LODGE, Jackson, N.C. The lodge hosts two hunters per day for cast-and-blast trips, providing guides and gear, but anglers can bring their own tackle. Striped bass are suckers for jigs, soft plastics, crankbaits and flies. All lures must have a single barbless hook. Lily Pond Lodge also hosts deer, bear and upland bird hunts with released birds. The main lodge is a restored farmhouse that sleeps up to 24 hunters. 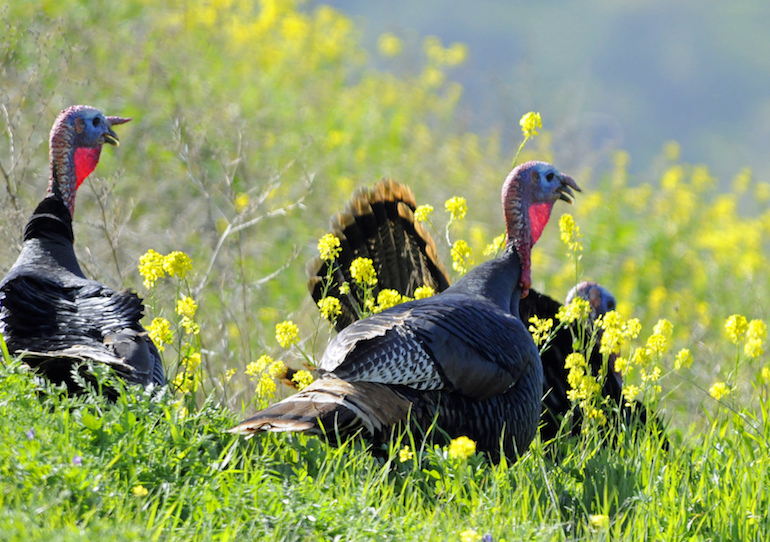 For turkey hunts, the maximum number of hunters is six. For deer hunters, the usual number is 12. All meals are furnished and the lodge has satellite TV and other amenities. Lily Pond has two satellite lodges used for deer hunting. Bridgers Creek hosts up to four deer hunters for three-day hunts on 1,500 acres. Verona Plantation accommodates 12 deer hunters, with access to 8,000 acres. The black bear hunting boasts a 100 percent success rate for trophy black bears. Upland hunting for pheasant, quail and chukar is available on a 100-acre licensed shooting preserve. The lodge also hosts tower shoots for pheasants. $$ ULTIMATE FISHING EXPERIENCE, Summerville, S.C. Fishing a private lake, with no one else around, is the ultimate adventure for bass anglers. The excitement grows when anglers catch bass on nearly every cast, which is what the Ultimate Fishing Experience provides. Located near Summerville, S.C., this series of private ponds is the perfect place for professional bass anglers to share on-the-water expertise. Anglers can also add duck or upland hunting to fishing trips. A sand-mining operation created the five fertile lakes many years ago. Since then, the owners have stocked bass and managed the population to produce high numbers of trophy fish. The lakes each have unique characteristics, ranging from tannin-stained to crystal-clear, along with a multitude of cover options including grass, reeds, brush, rock and shell beds for working with crankbaits and soft plastics, and shoreline cover for pitching and flipping. The different water and cover make this trip the ultimate learning opportunity with its controlled environment and secluded atmosphere. The VIP trips include duck hunting every Wednesday and Saturday from mid-November through January. The waterfowl lakes have an intensive management program that ensures lots of mallards and wood ducks. The duck hunts end at 9 a.m., with breakfast following immediately afterward. These blast-and-cast combination hunting and fishing trips provide all the fishing gear, shotguns and ammunition, and are guided by experts who make sure both adventures are successful. The upland hunting for quail and pheasants takes place on a shooting preserve where guides work pointing dogs. These hunts are available to kids of appropriate ages. The guides are bass pros Marc Deschenes and Mike DelVisco. Deschenes has been tournament fishing for more than 25 years and spent the last 17 years managing and guiding on these lakes. DelVisco has been involved in the bass industry all of his adult life, fishing his first B.A.S.S. Invitational while in high school. He is also a tournament competitor. Cabin Bluff, Cumberland River Retreat offers a huge variety of cast-and-blast opportunities. Its cabins have 20 rooms, which can host up to 40 guests. The base rate for a room and meals is $650 per day. The staff can tailor activities to clients and price them accordingly. Andy Ippersen and Erin Kraty are the sales directors who coordinate hunting and fishing. Other activities include tennis, golf, swimming, bocce ball and horseback riding. Turkey hunting is very popular in the 10,000 acres of fields and forests. Hunters also take deer and wild hogs. 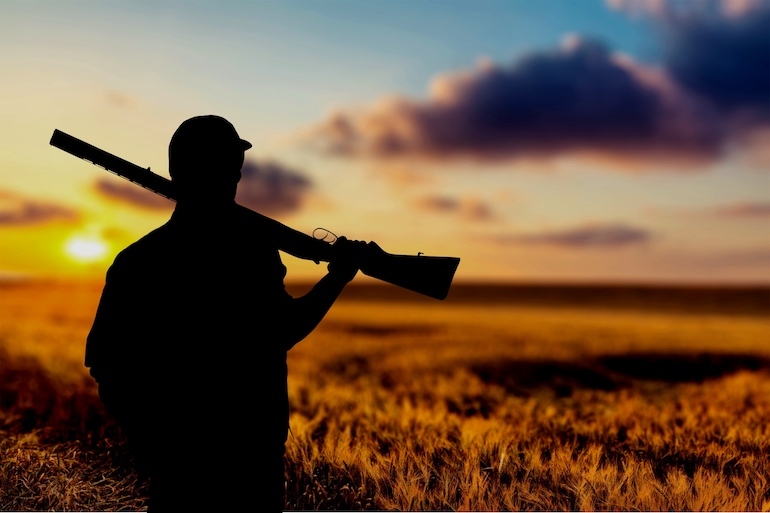 Upland hunters can hunt quail on 1,800 acres of intensively managed fields and pine savannah habitat. The resort also has sporting clays and five-stand ranges, and shooting instructors are available. Freshwater ponds on the property hold largemouth bass, sunfish and catfish. However, the saltwater fishing attracts more anglers to the Cumberland River and the nearby Atlantic. Anglers fish with guides from 18-, 24- and 30-foot boats, depending upon location and species. The Cabin Bluff property adjoins the Cumberland Island National Seashore. Anglers can sight-fish with fly rods for red drum, tarpon and speckled trout on the expansive flats and tidal marshes of the river. Instructors are available to touch up casting techniques before taking to the water or learn to use a fly-rod. Inshore fishing along the Atlantic Intracoastal Waterway presents excellent opportunities for speckled trout, red drum, bluefish, sheepshead, black drum and other species. Half-day and all-day guided trips are available for catching king mackerel, cobia, tarpon, grouper, snapper, sea bass and other species. The lodge furnishes allnecessary tackle and, by request, will have the catch cleaned and packaged for the ride home or prepared for meals by the chef. Phone: 912-729-5960. From Texas to Florida, the Gulf Coast Region is a hotbed of diverse ecosystems both on land and in the water. This makes the region an excellent area for sportsmen and women to conduct a cast-and-blast adventure that is second to none. $$$ Grosse Savagne Lodge, La. The cast-and-blast package at Savagne begins after arrival and check-in with an afternoon saltwater or bass fishing trip. Calcasieu Lake, known locally known as the “Big Lake,” offers anglers redfish and speckled trout fishing that rivals any saltwater estuary along the length of the Gulf Coast. From Savagne, guides take folks into the marshes around the Big Lake where redfish lurk. 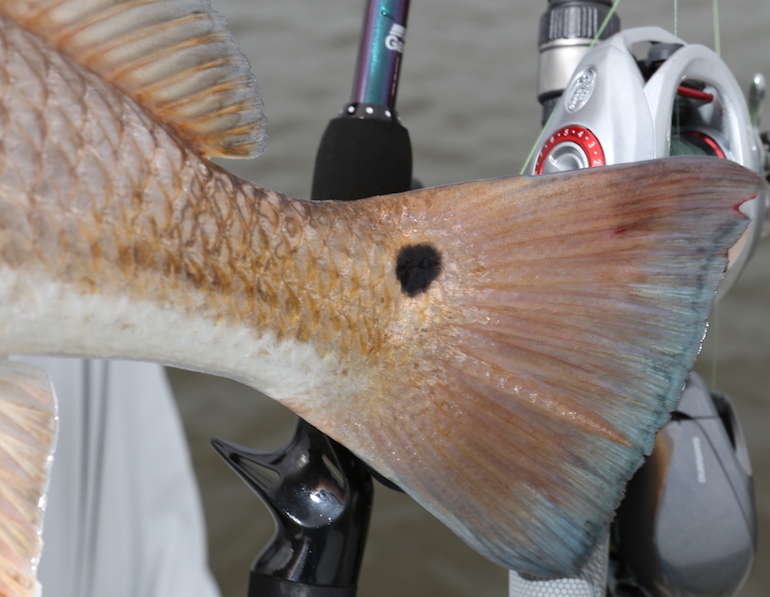 Speckled trout and flounder are also an option during teal season, as are bass in freshwater. Grosse Savagne lodge represents the finest in Southern hospitality, charm and cuisine. However, Savagne’s amenities and dining come second only to the lodge’s fishing and duck hunting opportunities. Teal, staying ahead of cool weather, flock to the Lake Charles region to rest and feed in the lush marshes and rice fields. The Alabama Black Belt region consists of 23 counties nestled between the state’s Appalachian foothills and the Coastal Plain. The region is widely known for excellent hunting and fishing opportunities. The region’s dark soil creates high-quality habitat for numerous kinds of wildlife, including white-tailed deer and bobwhite quail. The Shenandoah Plantation affords hunters opportunities to shoot quail and land ferocious black bass. Quail hunts include a seasoned guide and outstanding dogs. At both properties, they utilize early release quail programs, as well as an aggressive management of habitat for wild quail. The terrain is varied with rolling hills, fields and bottoms. Hunters will break for lunch around noon and go to the main house or lodge for a hot Southern meal. Folks can also cast a line on one of three premier trophy bass lakes located on the property. Each lake is professionally stocked and managed to produce high-quality bass. Lee’s crew targets redheads, bluebills and bufflehead but has also timed out the “golf course geese.” They spend days watching birds and have timed the arrival of the area’s golf course geese to the minute. This outfitter has put together trips that stray from the typical image of a cold, muddy, rainy duck hunt and has replaced it with white sands and palm trees. A cast-and-blast combo with Intercoastal Safaris is much different than with traditional outfitters. It is designed to meet the needs of a new generation of sportsman, while maintaining traditional standards of service that most will recognize. The morning portion of the day begins with a 10- to 30-minute ride, during which parties of four hunters are ferried to their duck blinds, where a hot breakfast is served. Hunting commences and continues until bag limits are reached or hunting conditions take a turn for the worse. Upon returning to the lodge, hunters change into fishing gear and are whisked to away to dine, in view of the bay, at the Flora-Bama Yacht Club. The fishing portion of the day starts after lunch, and there are a couple of options for anglers, such as heading into the marsh for redfish and trout. Two of the biggest benefits the Gulf Coast offers is diversity of game and year-round fishing opportunities. As such, clients can change it up and go offshore instead of into the marsh if they so desire. Dinner is served family-style at the yacht club, where the chef prepares meals with fish caught that day. Some things are meant to go together. Cookies and milk, Laurel and Hardy, and rum and Coke make the short list, but many Americans set “hunting and fishing” at the very top. To help our readers satisfy the desire to do both, we’ve compiled nine “cast-and-blast” locations that let sportsmen and women enjoy two trips for the price of one — no matter your budget. Formed by a series of violent earthquakes between 1811 and 1812, Reelfoot Lake offers excellent fishing and duck hunting. There’s no better lodging than the Blue Bank Resort — family owned and operated for five generations. Its current owner, Michael Hayes, maintains its stellar reputation for service, food, hunting and fishing. Ancient cypress trees rise from the lake’s surface; underneath, huge stumps offer prime fish habitat. Over one million birds migrate through the flyway; Blue Bank Resort is at the heart of it. The resort offers three-, two- and one-day guided duck hunting packages, and their spring, summer and fall/winter fishing packages include lodging, boat, motor, gas, bait and ice. Blue Bank’s fishing pro, Billy Blakely, a 35-year lake veteran, will answer questions and suggest prime spots. All fishing package amenities are included with any hunting package. Duck hunts begin around 5 a.m. with a buffet breakfast. Blinds are only a short boat ride away and feature full kitchens, heat, couches/recliners, with space for up to 15 people. Guides, most with decades of experience, will call ducks until noon and prepare lunch in the blind. After lunch, hunters can continue shooting until 3 p.m. or until reaching their limit. Looking for a premium experience without the formality of luxury lodges? Hit Deer Creek Lodge in western Kentucky. It’s hosted wingshooters since the early ’80s, and in 2005 a 30-acre lake stocked with trophy bass was added. Deer Creek has two cast-and-blast packages. Quail-and-bass packages let sportsmen hunt the first day and fish the second, and three-day turkey packages let guests pursue gobblers each morning and fish the afternoons. Guides are provided for all hunting, but guests can choose whether they want a fishing guide. The main lodge, Wingshooting Lodge, boasts 10,000 square feet and sleeps 16 people. Lakeside Lodge is a “family treat,” Tim Chappell, Deer Creek’s marketing manager, said, and has three bedrooms sleeping eight. Whitetail Lodge is the land’s original farmhouse, renovated in 1999. All packages include lodging, meals, cocktails, guides, animal dressing and field transportation. “Laid back” only applies to the lodge. Deer Creek takes hunting and fishing seriously. The carefully managed 3,000-acre property offers habitat for upland birds, ducks and turkeys. The property’s turkey kill ratio is between 80 and 90 percent, and its central location (and October-to-March season) maximizes opportunities. Arkansas is famous for trout and ducks. 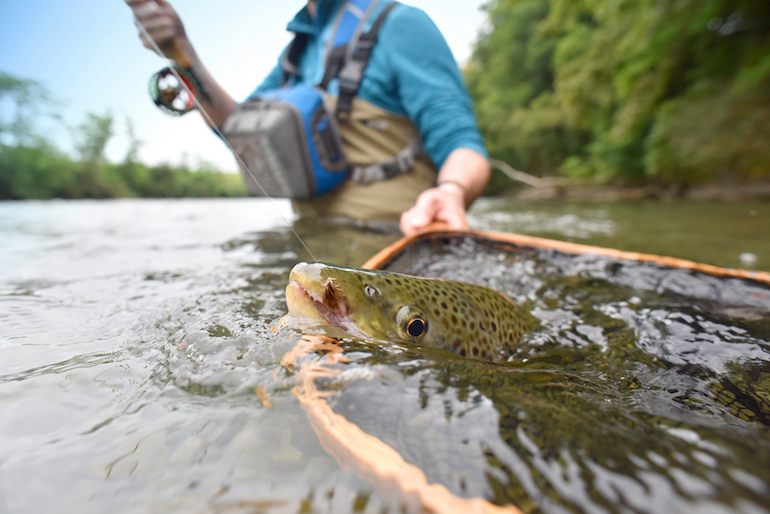 Fortunately, you can access birds and fish on one trip if you’re willing to drive a bit between trout waters and the Mississippi Flyway.In the Ozarks, you’ll find the White River Inn, an all-inclusive fishing lodge specializing in brown, rainbow, cutthroat and brook trout. Watson and his wife founded it 13 years ago. Five suites are available; each has private entrances, custom-made Mission-style furniture, individual climate control, a fireplace and a Jacuzzi tub. All meals, snacks, mixers, equipment and guides are also provided. He said that more 10-plus-pound browns come from this fishery than any in the country. “We’re the world’s best brown trout fishery, and that’s undebatable,” he said. After fishing, drive two hours east to the Stan Jones Mallard Lodge, a luxury hunting lodge in prime duck country. Stan Jones founded it in 2012, but he’s been guiding much longer. “When I was in 9th grade, I would take my school principal and superintendent duck hunting,” Jones said. “I’d miss class, but nobody seemed to mind.”Since then, he’s been building his 8,000-acre property to include 52 hunting locations. 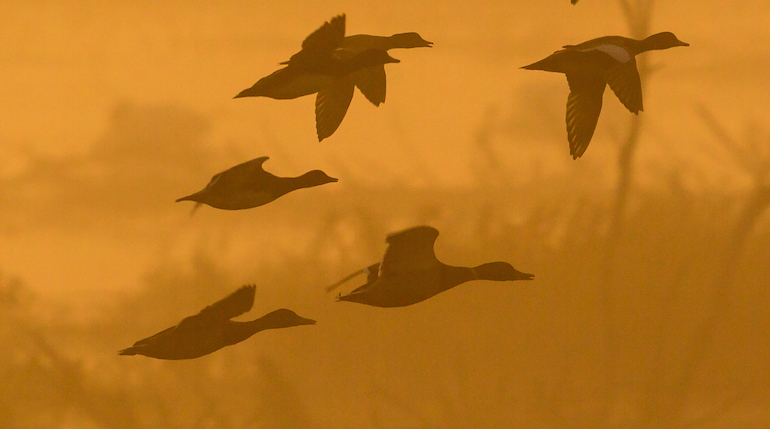 Only six to eight spots are hunted any given day, leaving ducks over 40 habitats to rest and grow.